Bird's-Eye View of the Battle of Tel-El-Kebir. This is a stunning c. 1890 birds-eye view of the Battle of Tel-El-Kebir, drawn by G. W. Bacon. The view beautifully depicts the battle fought between British military and the Egyptian army under Ahmed Arabi during the Anglo-Egyptian War of 1882. In the foreground the vast British forces can be seen fighting with rifles and cannons and on horseback. The British commander Sir Garnet Wolseley and his staff are specifically illustrated in the lower left quadrant. A railway loaded with a 40-pounder gun and soldiers is also beautifully illustrated. In the background the Egyptian army, including Arabi fleeing with his men, is visible. The town of Zagazig can be seen in the far distance. The bottom margin includes a list of British regiments, guards, batteries and other sites indicating their location in the view. Spiritually, this view is Bacon's assertion of western, and in particular British, cultural superiority. The organized British forces in the foreground stand nobly against the numerically superior Egyptian hordes stretching far into the horizon. On the British side, we see technological innovation in the form of trains, cannon, and sophisticated riflery. To either size of the engagement medical carriages symbolizing mercy and compassion stand ready to take in the wounded. Bacon is thus merely illustrating via the events of te Anglo-Egyptian War, the popular 19th century justification, by virtue of perceived social, technological, and cultural sophistication, for global European hegemony. Following the bombardment of Alexandria in July of the same year, Ahmed Arabi became a nationalist hero. Garnet Wolseley was given charge of putting an end to Arabi's regime. After a few other battles, the war culminated in a battle near Tel-El-Kebir, and the final attempt by Arabi to defend Cairo. The British superiority in warfare is evident in this view. Arabi's troops were unable to prepare their defenses and were forced to retreat. The British pursued and eventually captured Cairo, leading to Egypt becoming a British protectorate until it gained independence in 1922. Ahmed Arabi was banished. 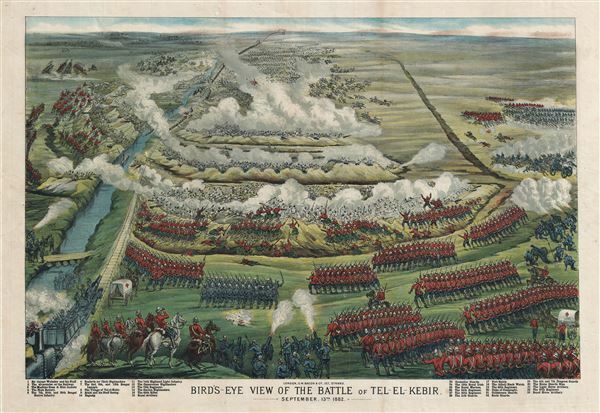 This chromolithograph view of the battle was issued by G. W. Bacon and Company, 127, Strand, London. Very good. Blank on verso. Minor wear in top margin. Backed with archival tissue.